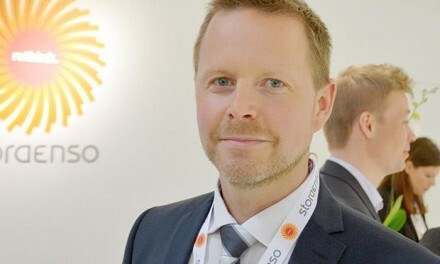 Tekfors AB was founded in 2010 and the company is focused on environmental technologies in Computational Intelligence (CI), Combinded Cooling, Heating and Power (CCHP) and Food Safety. Their food safety system is called Tekfors-FFS (FFS stands for Family Food Safety). The company's headquarters are located in Västerås. Tekfors has special competence in sensors, communication technology, software and statistics. Having access to safe food is a basic requirement of consumers worldwide. But in a globalized society, the logistics of food products that travel from farm to dinner table have become increasingly complex. New eating habits have resulted in changing patterns of production, distribution and storage. Chemical substances and microorganisms can cause pollution in several stages in the supply chain. 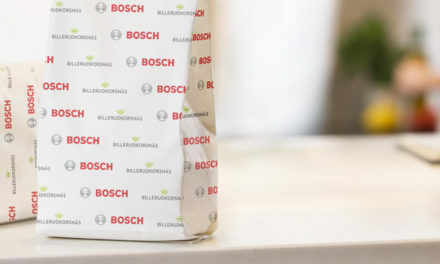 Pesticides, heavy metals, microorganisms, chemical substances leaking from the packing material, and other unwanted contaminants can poison our food. Another problem area is the manipulation of food that occurs, and where illegal substances are added to supplement the product, to reduce production costs or other reasons. A well-known example is the chemical melamine that was added to milk powder in China and that caused the poisoning of thousands of infants. Authorities, researchers and consumers agree that the food chain from farm to dinner table must be improved. It requires, for example, new rapid analytical methods for testing the presence of toxic substances and microorganisms and the need for safer storage solutions, new packaging and distribution systems. One who has thought deeply about food safety is Nannan Lundin at the company Tekfors AB. Her team has developed a test instrument that is connected to a network and can be easily used by the consumer to scan for contaminants in food. “The spectrometer will be visible by people all over the world and there will be practical advice when the information comes back to you. For example, “contaminated, refrain purchase” or “put the apple in water 1-2 days and test again,” says Nannan. “Our system has Swedish and European food laws as a starting point and gives a warning if the deviation from the normal content is too great. A warning does not necessarily mean that the food is dangerous, but it does alert the consumer to be careful. In the analysis, a check against known types of pollutants is made,” concludes Nannan Lundin. A handheld spectrometer with simple user interface tailored to consumers. Classification algorithms and data profiles for different types of food, both in solid and liquid form. A simple web service for downloading and updating data profiles, which makes the system scalable and adaptable to a wide range of food and thus different consumer needs. 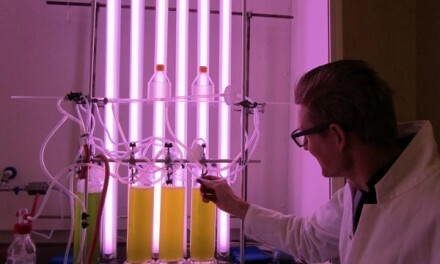 The basic starting point is not to measure the concentration of various pollutants and analyze one chemical at a time. 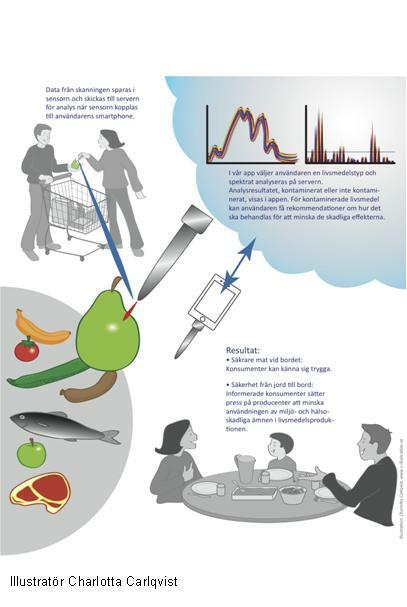 The system is made instead from properties of pure and contaminated food and a statistical classification of algorithms are used to determine if the sample spectrum (“fingerprint”) is consistent with the spectrum of non-contaminated food. This analysis becomes easier and cheaper, and the system can also detect abnormalities believed to consist of new or unknown harmful substances. Tekfors’ business plan is to sell the spectrometer, app and related technologies and that the spectrum library would be handled by an external partner.